Current ongoing studies and research into the health benefits of ginger are turning up new and exciting medicinal discoveries all the time! And I think we can safely call this a super spice! ...And, out of all the spices and herbs I've researched, it appears this one is definitely one of the most beneficial. I'd go as far as to say only turmeric comes anywhere close! Many cultures have used it fresh or dried for a wide range of traditional medicinal purposes. 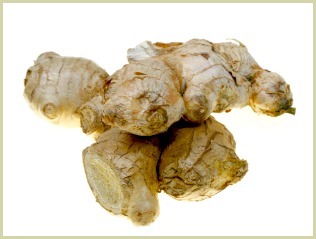 Harvested from the roots of the ginger plant, this spice is even gentle enough for pregnant women to use. Read more about the plant itself. One of my favourite shows is the US TV series "Mythbusters", and they tested ginger pills on sea and motion sickness which proved their validity. ...You can use fresh or ground root in your recipes. Though fresh is definitely better, the ground stuff does have many assets. My favourite way of getting more of it, and a favourite of traditional medicine, is to make a cup of tea from the root. Click for my recipe. If you use a lot of the powder in your home cooking, then adding it to homemade blends and mixes is another great way of getting more in your diet. Note: A good, but not necessarily easy, way of having a continual supply of the root is to grow it yourself. Read more on my growing tips. Turmeric Benefits - The Healthiest Spice of All!